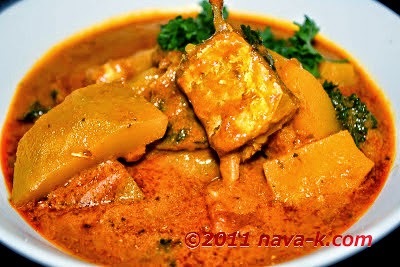 Don't say anything unless you have cooked or you have tasted Pumpkin And Salted Fish Curry. Otherwise, leave it up to me to do the talking. Salted fish on the whole (Salted Fish Mango Sambal, Pada Salt Fish Pickle & Salt Fish Pickle)? In the first place, are you a salted fish lover? If you are, I say none further and when salted fish is cooked with pumpkin and in a spicy curry? Tad bit of sweetness, tad bit of sourness, tad bit of saltiness and a whole lot of spiciness. I think the picture of Pumpkin And Salted Fish Curry has also spoken? Mix curry powder with the paste. Heat oil and fry until aromatic and oil floats. Pour 3 cups of water, stir and simmer. Once heated through, add pumpkin, salted fish and lime juice. Simmer to soften pumpkin and salted fish. Heat through, remove from heat and combine in coriander leaves. what type of salted fish? Is it Ikan Talang? its kurau in our language.